Bookmark this page to get the latest national exit poll data and analysis. It's election night in America, and before we know who wins, we're getting a glimpse of who turned out at the polls and what motivated their votes. This is preliminary data and can change -- sometimes materially -- as the evening progresses. Be sure to check back for the latest. We've received the first batch of exit poll data and are updating with analysis as we receive it. Much of the campaign focused on Hillary Clinton’s and Donald Trump’s personal qualities. Both reached record levels of unpopularity for presidential candidates, with sharp divisions on their fitness for office on items such as qualifications, temperament and honesty. In preliminary national exit poll results 54 percent of voters see Clinton unfavorably, and 61 percent say the same of Trump. Comparable numbers in 2012 were 46 for Barack Obama and 50 for Mitt Romney. Substantial numbers say both Clinton and Trump are not honest and trustworthy — 59 percent in Clinton’s case and 65 percent in Trump’s. It’s unprecedented even to ask this question in an exit poll. Clinton does better, Trump less well, on qualifications and temperament. Fifty-three percent of voters say she’s qualified for office, and 56 percent say she has the right personality and temperament for the job. 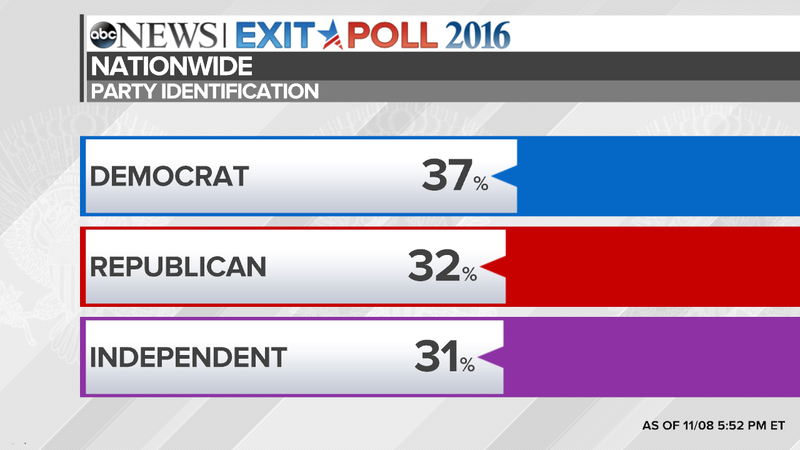 Those decline to 37 percent and 34 percent for Trump, respectively, in these preliminary exit poll results. The exit poll also asks which of four other candidate qualities are most important. In preliminary results, 38 percent say it’s someone who can bring about needed change versus 22 percent who say it’s experience and 22 percent who cite good judgment. 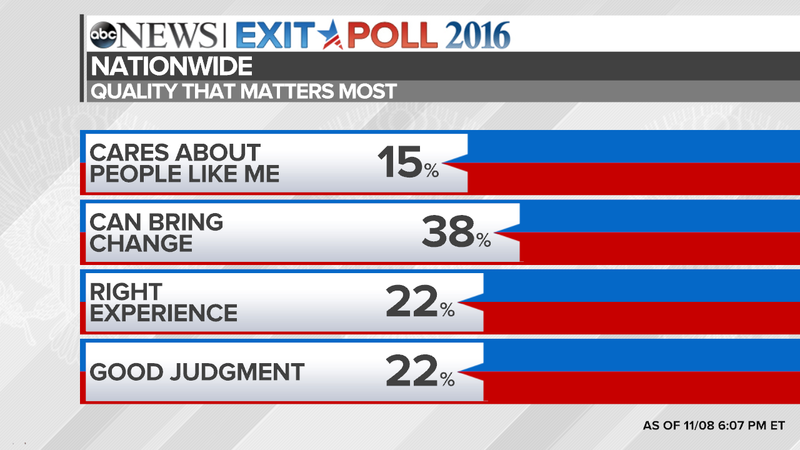 Only 15 percent say it’s “someone who cares about people like me.” Among Clinton supporters, experience and judgment are most important, while among Trump supporters, it’s nearly all about change. Preliminary exit poll data has shed some light on rural, suburban and urban attitudes and views. About 20 percent of urban respondents said that they were worse off financially than they were in 2012. That can be compared to 28 percent of those who live in the suburbs and 36 percent who live in rural areas. Some 57 percent of urban voters say that they rate the economy negatively. That's compared to 63 percent of suburban voters who were asked the same question, and 72 percent of rural voters. When it comes to who they trust to handle the economy, Clinton-Trump, urban respondents went 57-37 percent for Clinton, while suburban respondents went 44-49 percent. Rural respondents went 33-63 percent in favor of Trump. Responding to the rather pessimistic question about whether they believe life will be worse for the next generation than today, 27 percent of urban respondents said yes, while 35 percent of suburban and 41 percent of rural respondents did. And when it comes to belief that the economy is on the wrong track, 53 percent of urban respondents said that they believed it was. That's compared to 63 percent of suburban and 71 percent of rural respondents who said that they believed it was on the wrong track. Some quick observations on polarization, based on preliminary exit polling data. Among Trump supporters, 96 percent have an unfavorable opinion of Clinton. Among Clinton supporters, 95 percent have an unfavorable opinion of Trump. The preliminary exit poll data also reveals some interesting nuggets about division and unpopularity. Eighty-one percent of Trump voters think Obamacare “went too far.” Half of Clinton voters think it didn’t go far enough. Forty-four percent of Trump voters say their financial situation is worse than it was four years ago; 47 percent of Clinton voters say their finances have improved. Here's further evidence of the unpopularity of these candidates: 20 percent of Trump’s own voters nonetheless view him unfavorably. Twelve percent of Clinton voters say the same of their candidate. And 28 and 24 percent of Trump and Clinton voters, respectively, don’t feel their own candidate is honest and trustworthy. Trump incites greater fear than Clinton, especially among women: 43 percent of women say they’d feel scared if Trump were elected, compared with 31 percent of men. Nearly twice as many women as men say they’d feel excited by a Clinton win, 22 vs. 12 percent, respectively. And, 72 percent of Clinton supporters feel scared by a Trump presidency, 59 percent of Trump supporters are scared by a Clinton presidency. When it comes to views on whether the country is headed in the right direction, just 31 percent of Clinton voters say the country is "seriously off on the wrong track." Compare that to Trump voters -- a whopping 93 percent of whom say the country is on the wrong track. (Shelby Lum/Richmond Times-Dispatch via AP) Voters line up in voting booths to cast their ballots at Robious Elementary School in Chesterfield, Virginia, Nov. 8, 2016. Trump’s treatment of women and Clinton’s use of a private email server while secretary of state have been highly controversial issues. Given their unpopularity, Clinton and Trump alike are seeing lukewarm support — including many voters who chiefly oppose their opponent rather than supporting them. This is especially so in Trump’s case, and far different from what we saw in 2012, when 70 percent of Obama’s voters strongly supported him, as did 60 percent of Romney’s, compared with only 10 percent who voted against their candidate’s opponent. Many voters express concern about a Clinton or Trump presidency, and excitement is subdued. Seventeen percent are excited about the prospect of a Clinton presidency, while 29 percent are downright scared about it. On the flip side, just 13 percent are excited about a possible Trump presidency in preliminary exit poll results; 37 percent, scared of it. The divisions are profound. Among Clinton supporters, 72 percent are scared of Trump in office; among Trump voters, 60 percent are scared of what Clinton would do. Previous positive and negative anticipation peaked in 2008, when 37 percent of voters were excited about an Obama presidency and 33 percent were scared about McCain. When did voters make their decision? Despite the frantic finish and a series of major events near the end of the race, 75 percent of voters say they decided on their vote more than a month ago. 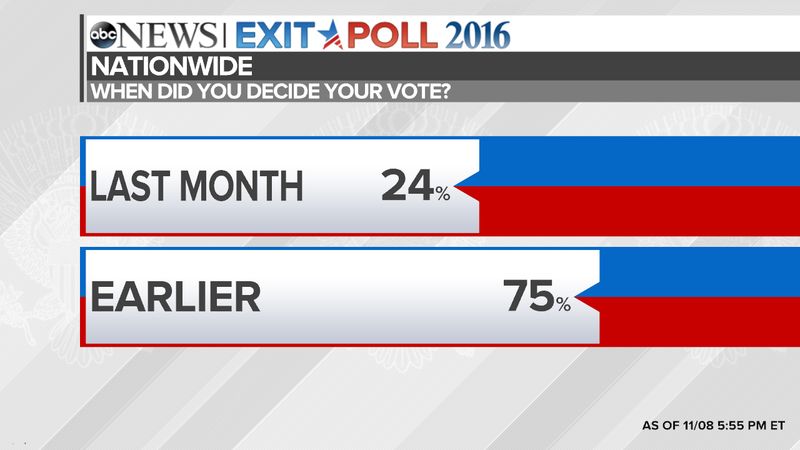 Still, 24 percent of voters say they made their choice in the last month. They’ll both be important groups to watch as the night goes on. Whatever their divisions, many voters share a sense of frustration with the political situation. Sixty-one percent of voters in preliminary exit poll results say the country’s on the wrong track. That’s similar to its level in 2012 when Barack Obama won re-election and down from 75 percent in 2008 at the peak of the economic crisis, but well above its level from 1996 to 2004. Sixty-nine percent are dissatisfied with the way the government is working, including 23 percent who are angry about it — a sentiment especially prevalent among Trump voters. And 49 percent say the government’s doing too many things best left to individuals and business, similar to most previous elections. Clinton and Trump voters are vastly different on these measures, with Clinton’s much more positive and Trump’s much more negative. For example, 92 percent of Trump’s supporters feel the country’s on the wrong track and 88 percent are dissatisfied with the how the government’s working, or angry about it. The state of the economy relates to these sentiments. Eight years on from the Great Recession, 62 percent of voters in preliminary exit poll results still rate the economy negatively — “not good” or “poor.” Still, that’s well down from 76 percent in 2012 and a vast 93 percent in 2008. Thirty percent say their family’s financial situation has improved in the last four years, but about as many, 27 percent, say it has gotten worse. (The rest say it’s about the same.) It’s the first time “better” has outnumbered “worse” on this question since 2004 and the lowest “getting worse” result since 2000. Expectations, though still not great, are better than they’ve been: In preliminary results, 37 percent of voters think the next generation will be worse off, but 33 percent think it will be better off, again the least negative differential since 2000. Again pessimism is far higher among Trump supporters. (Amber Arnold/Wisconsin State Journal/AP Photo) Voters cast their ballots at the Wil-Mar Neighborhood Center on the Near East Side of Madison, Wis., Nov. 8, 2016. Just 28 percent of Trump voters say they’re very confident their votes will be counted accurately versus 68 percent of Clinton voters. There was no partisan gap on this question when it was asked in the 2008 exit poll, and the division this year is bigger even than the one between Kerry and Bush voters in 2004, after the contentious 2000 election. 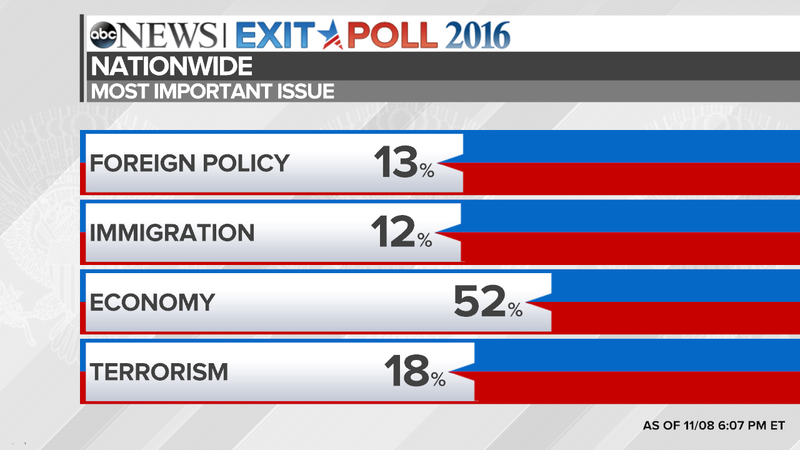 Preliminary exit poll results indicate that the economy/jobs is the top issue for voters (52 percent), followed by terrorism (18 percent), foreign policy (13 percent) and immigration (12 percent). There’s a big difference, though by candidate support, with Clinton’s supporters relatively more focused on the economy and foreign policy, Trump’s on terrorism and immigration. Voters split roughly evenly on whom they trust more to handle the economy (46 percent say Clinton versus 48 percent who pick Trump), while Clinton has a clear advantage on foreign policy (53 percent versus 42 percent) and a slimmer one on serving as commander in chief (49 percent of versus 46 percent). Many more voters say undocumented immigrants should be given a path to citizenship or be deported (71 percent versus 25 percent). And more oppose rather than support one of Trump’s signature policies, building a wall along Mexican border (54 percent versus 40 percent) in preliminary exit poll results. Not surprisingly, Clinton and Trump voters differ widely on these immigration policy issues. Also, 9 percent of voters were not born in the United States — a group to watch in later results. Fifty-four percent of voters approve of the job Obama is doing as president, 34 percent strongly so in preliminary exit poll results. That may help Clinton, but it’s no guarantee: In 2000, a robust 57 percent approved of Bill Clinton’s job performance when Al Gore tried unsuccessfully to follow him. Slightly more voters think the next president should continue Obama’s policies (28 percent) or change to more liberal ones (18 percent). 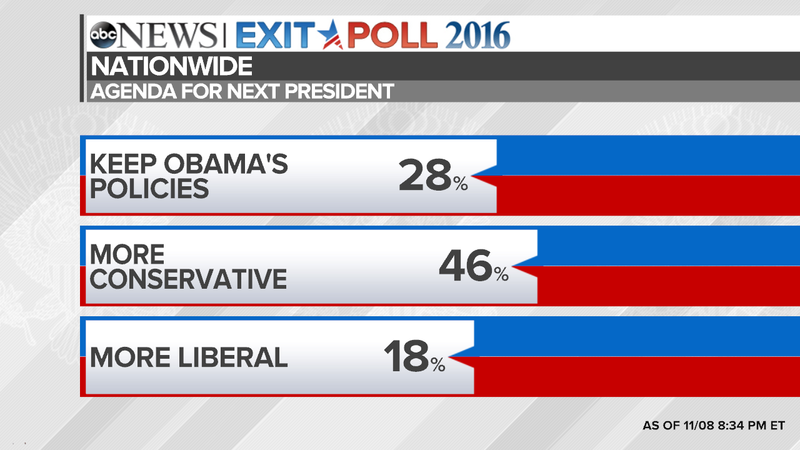 Forty-six percent say the next president’s policies should be more conservative that Obama’s. Turnout among key groups is critical. ABC News/Washington Post pre-election polls indicated that, apart from partisanship and ideology, Clinton’s success is dependent on turnout among women, college-educated whites (especially college-educated white women), nonwhites and young voters. Trump needs turnout from men, whites overall, non-college-educated whites (especially non-college-educated white men) and evangelical white Christians. Turnout and vote margins among these groups will be worth watching tonight. 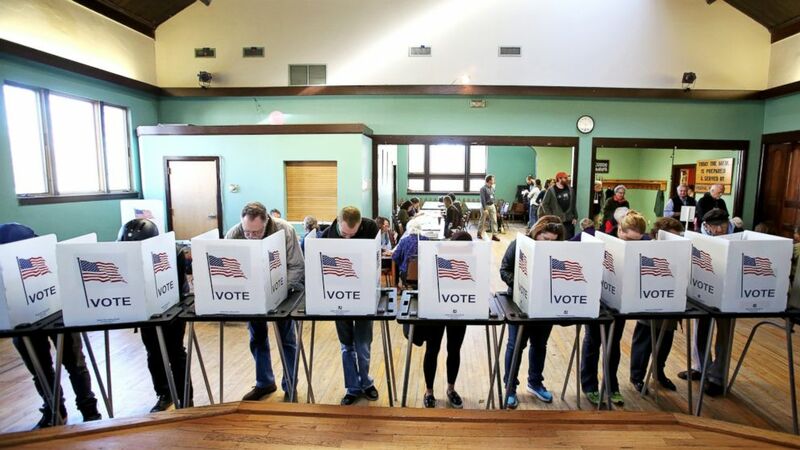 Early turnout across partisan lines looks quite similar to 2012, 37 percent Democrats, 32 percent Republicans. 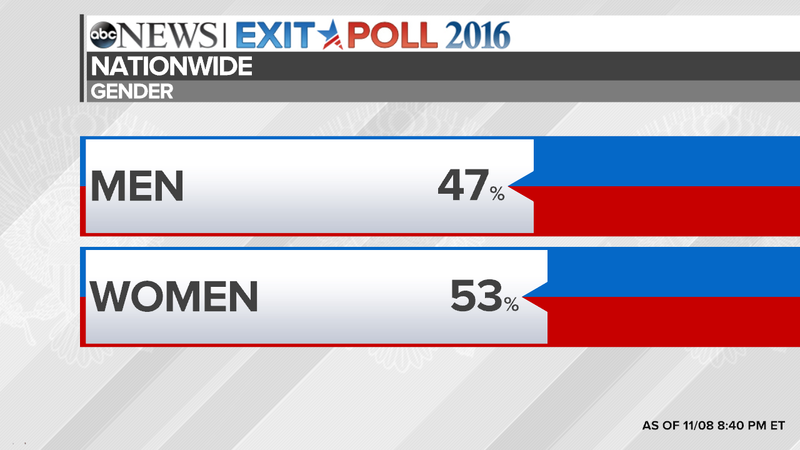 The gender gap so far appears to be historic -- the widest in exit polls back to 1976. In preliminary exit poll results, Clinton +12 among women, Trump +12 among men. Trump’s margin among evangelical white Christians has been huge -- 81-16 percent. We have data just since 2004, but this is the widest GOP margin among white evangelicals in that time. On race, whites could be slightly down — 70 percent in preliminary exit poll results, 30 percent nonwhite, including 12 percent black and 11 percent Hispanic. Women outnumber men in 2016 early results, as they have since 1984. 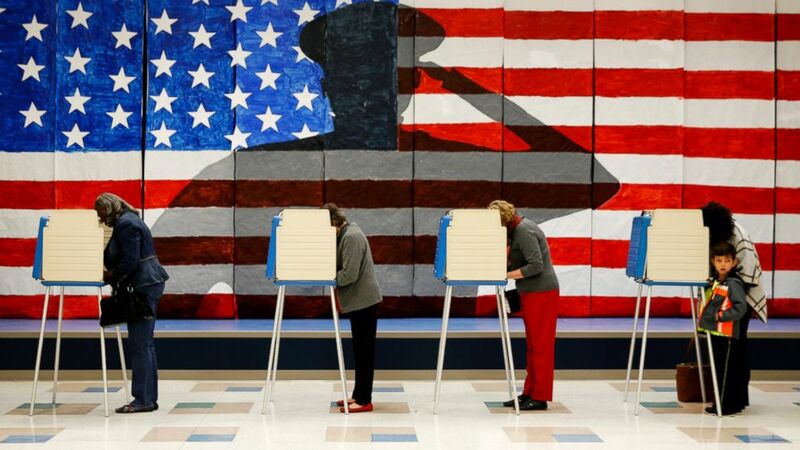 Men accounted for 47 percent of the nationwide vote, while women accounted for 53 percent. If the gender gap that was evident in pre-election polling holds tonight, it’ll be an advantage for Clinton. Early exit poll results show a record level of turnout among college-educated voters, 50 percent versus 50 percent non-college-educated voters. Again, these are early results, but it’s worth keeping an eye on and would be another Clinton advantage if it holds. College-educated white women outnumber non-college-educated white women (20 percent versus 17 percent), which would be a first in exit polls. College-educated white women are by far Clinton’s strongest group among whites. There’s no indication in early results of increased turnout among non-college whites, Trump’s core group. White evangelical Christians make up 27 percent of voters in preliminary exit poll results, similar to 2012, and a very strong group for Trump in pre-election polling. Nationally, 21 percent of voters call appointments to the U.S. Supreme Court “the most important factor” in their decision, preliminary exit polls indicate. (Though President Obama did put forth a nominee, the Supreme Court seat vacated when Justice Antonin Scalia passed away in Feburary, remains open.) These voters overwhelmingly favor Trump, 57 to 40 percent. Finally, a few other miscellaneous observations from the preliminary data. Among the 5 percent of voters who supported someone other than Trump or Clinton, most -- 56 percent -- said they wouldn't have voted at all if those two were their only choice. But of the remaining 44 percent, slightly more say they would have voted for Clinton than for Trump. Nationally, Clinton won young voters aged 18 to 28 -- 55 to 37 percent. That's a much closer margin than Obama experienced in 2008 (66 to 32 percent) or 2012 (60 to 37 percent). But broken down by gender, it's a different story. Young men broke almost evenly, 46 percent for Clinton and 42 percent for Trump. Young women, by contrast, overwhelmingly chose Clinton, 63 to 31 percent. Asked the most important attribute (of four choices) to them, 70 percent of Trump voters pick a candidate who “can bring needed change.” As many Clinton voters pick either experience (41 percent) or good judgment (28 percent). Trump supporters only split on deportation -- 50 percent think illegal immigrants working in the U.S. should be offered a chance to apply for legal status, 45 percent think they should be deported. Among Clinton voters, 88 percent favor a path to legal status. Trump voters are more united when it comes to building a wall along the border with Mexico -- 74 percent support it. Just 8 percent of Clinton backers agree, a profound split. White evangelicals account for nearly half of Trump supporters, 46 percent; 9 percent of Clinton’s. If you're looking for something else to read while you wait, be sure to check our live blog and read up on the 10 Storylines to Watch on Election Day. We're also tracking possible voting irregularities throughout the day. And if you're curious about congressional races, we've got you covered for the Senate and the House. ABC News' Suzanne Dacunto, Donald Pearsall and Lisa Fisher contributed graphics to this report.